Ventral margin is moderately concave to almost straight (smaller valves). Dorsal margin is convex and biundulate in medium-sized to larger valves and weakly biundulate to straight in smaller valves (not shown above). The double undulations on the dorsal margins are often quite variable in height and shape from consistently rounded to more pointed. The apices are obliquely capitate and dorsally reflexed in medium-sized to larger valves and truncate in smaller valves. Helictoglossae positioned somewhat distant from the apices. The distal raphe ends are curve on to the valve face and are clearly visible in the LM. Striae are radiate. 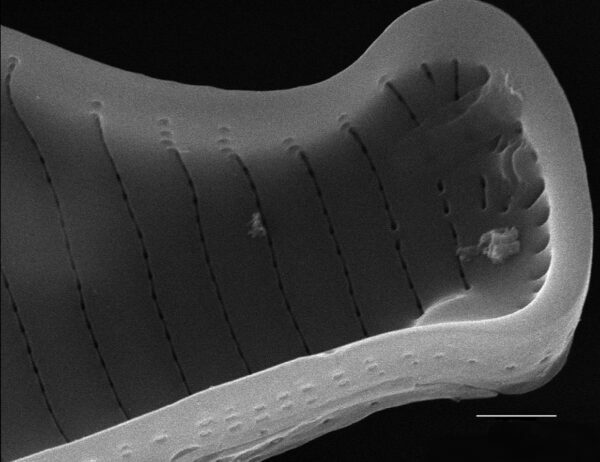 One apical rimoportula is present just dorsal to the center of the apex (visible in SEM). 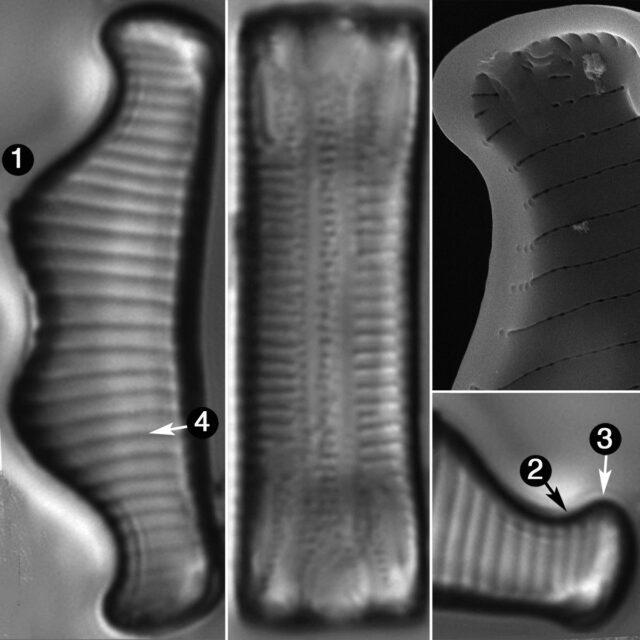 Also under SEM, the internal openings of the areolae are aligned in a narrow groove. Eunotia subherkiniensis has consistently been recorded under incorrect names in North America, primarily as E. bigibba Kützing sensu Grunow. The illustrations of E. bigibba (E. praerupta var. bigibba) in Krammer & Lange-Bertalot (1991, Taf. 150: Figs 1 – 7) are in error and the correct type of E. bigibba is described in Kützing 1849 and a lectotype is designated and illustrated in Lange-Bertalot et al. 2011 (Pl. 83, fig. 1). Found in streams, wet walls and waterfalls, often epiphytic on bryophytes. 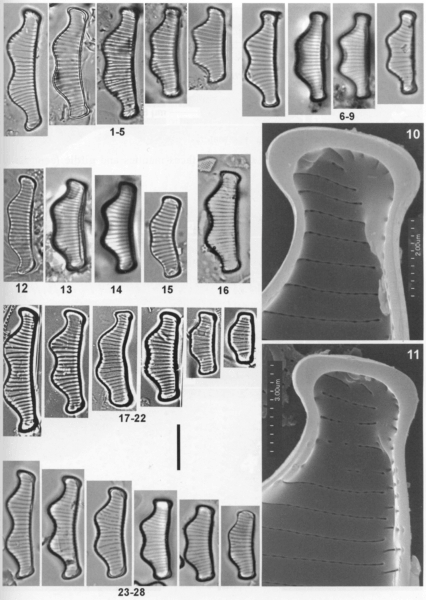 Valves with moderately concave to almost straight (smallest specimens) ventral margins. Dorsal margins from strongly to slightly bigibbous, inflations of smallest specimens merge to a single one. Ends more or less protracted obliquely capitate and dorsally reflexed, in smallest specimens only simply truncate. Length 10-30 μm, breadth 5-8 μm. Short terminal raphe fissures usually in somewhat distant position from the poles (as in E. bigibba, but unlike E. papiliofalsa). Striae 12-15/10μm, only little denser spaced at the ends than in the middle of the valves. Areolae not to resolve in LM, SEM ca. 40 / 10 μm (see Figs 95: 10, 11; 96: 1-6). Krammer, K. and Lange-Bertalot, H. (1991) Bacillariophyceae. 3. 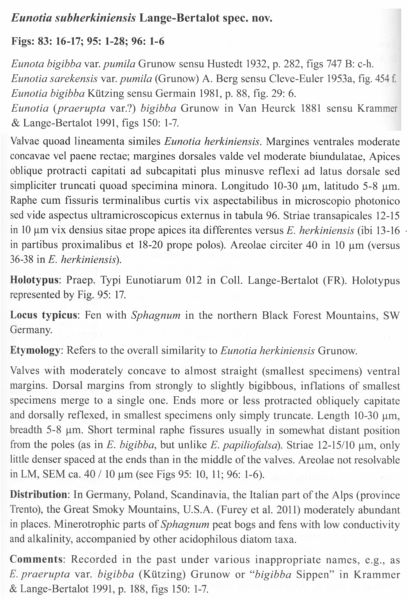 Teil: Centrales, Fragilariaceae, Eunotiaceae In Ettl, H., Gerloff, J., Heynig, H. & Mollenhauer, D. (Eds.). Süsswasserflora von Mitteleuropa. 2(3): 1-576. Gustav Fisher Verlag, Stuttgart, Germany. Kützing, F.T. (1849) Species Algarum Lipsiae. F.A. Brockhaus, 922 pp. The dorsal margin is convex and biundulate.The apices are obliquely capitate and dorsally reflexed in medium-sized to larger valves, truncate in smaller valves. Striae are radiate. Internally, the openings of the areolae are aligned in a narrow groove (SEM).